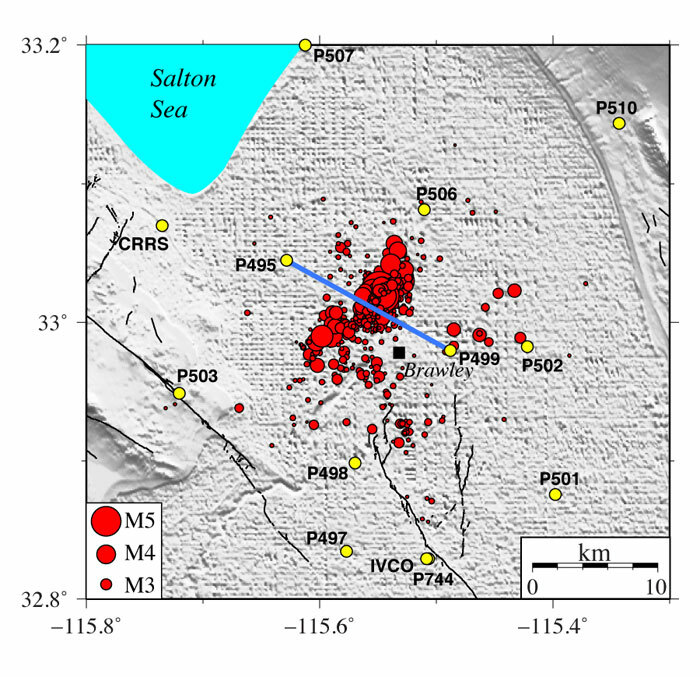 A seismic swarm near Brawley, CA, south of the Salton Sea, began on August 26, 2012, at 04:30 GMT (August 25, 21:30 PDT). 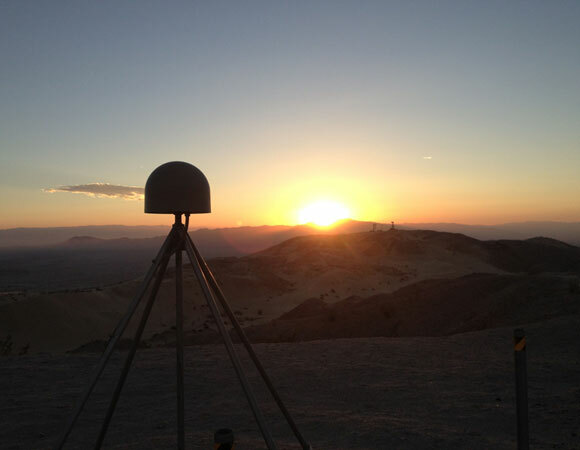 Over 500 events were recorded by the Southern California Seismic Network by August 29. The two largest earthquakes in the swarm were a M5.3 at 19:31 August 26 (12:31 PDT) and a M5.5 at 20:57 August 26 (13:57 PDT). Many of the events were reported felt across much of southern California. The town of Brawley is located less than 5 km (3 miles) from the swarm, and minor damage was reported. 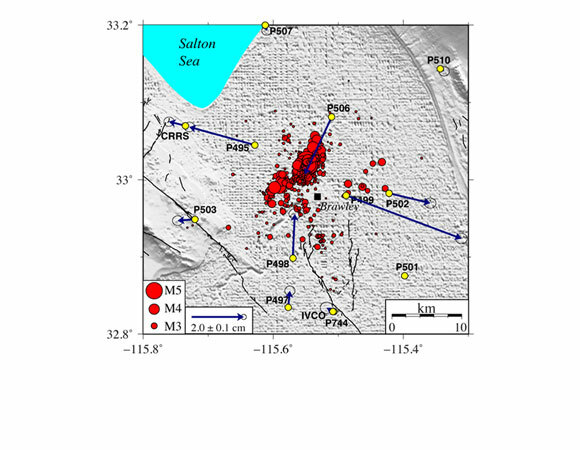 The Plate Boundary Observatory (PBO) operates ~17 permanent GPS stations within 30 km of the swarm. 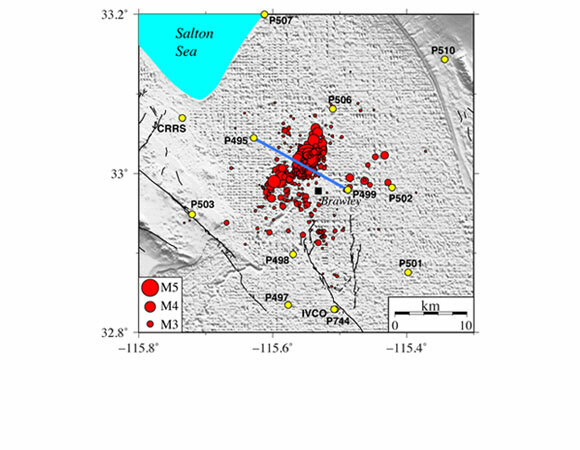 Standard-rate (15s) GPS data have been analyzed by several groups to generate preliminary ground motion measurements associated with this event. 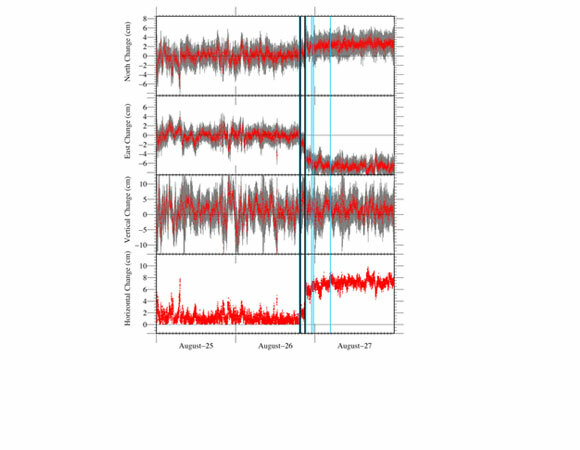 The PBO GPS Analysis Center Coordinator (T. Herring, MIT) produced co-seismic offsets based on the difference between rapid solutions on 8/27/2012+8/28/2012 minus 8/24/2012+8/25/2012, as shown in Figure 1. The computed offset values are available here [.txt]. Kinematic processing of a baseline (Figure 2) across the swarm area by UNAVCO revealed up to 6 cm of relative motion between stations P499 and P495 (Figure 3). 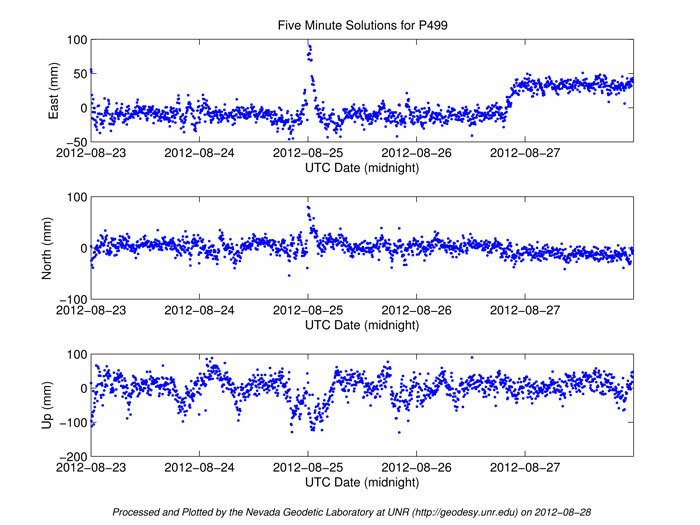 A rapid GPS processing service at University of Nevada-Reno generated five-minute time series showing clear step functions at the nearest GPS station, P499 (Figure 4). Led by G. Blewitt, the UNR rapid analysis system started as a prototype in September 2011, and as an operational service in July 2012 with NASA funding. The UNR service provides next day, 5-minute solutions from about 4,000 stations globally. 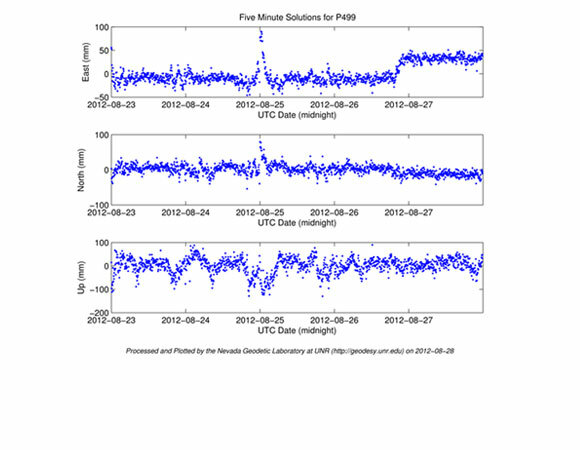 PBO data products are available at GPS/GNSS Data In addition to standard-rate (15s) GPS data, UNAVCO has also downloaded and posted high-rate (5 Hz) data from 14 GPS stations located near this event. These high-rate data are available via ftp://data-out.unavco.org/pub/highrate/rinex/2012/239/. Figure 5 is a photo of nearby GPS station P493, Superstition Mountain, taken while downloading high-rate data during the event. Figure 5. Photo of GPS station P493, Superstition Mountain, taken while downloading data during the Brawley seismic swarm. (Photo by T. Pitcher). The Brawley seismic zone is a transition zone between the San Andreas fault zone and the Gulf of California spreading center. The spreading center is rifting the Baja Peninsula away from Mexico while the San Andreas fault zone accommodates northwest motion of the Pacific Plate relative to North America. The Brawley seismic zone has experienced swarms before, and the last large swarm was in 2005. More information about this event and tectonic setting may be found at the Southern California Seismic Center. 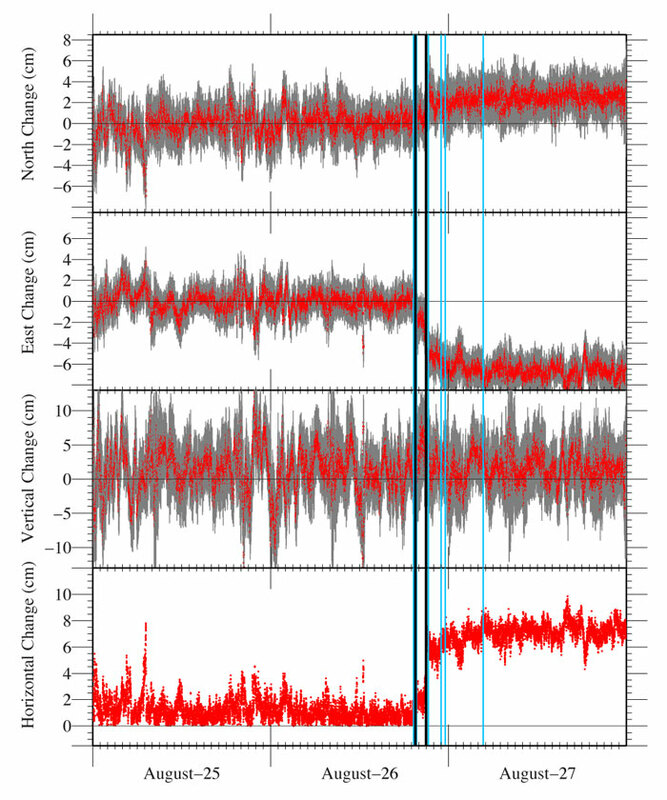 Additional information regarding these PBO data and preliminary analyses will be presented at the 2012 Southern California Earthquake Center (SCEC) Annual Meeting in Palm Springs, CA, September 9-12. A poster titled "PBO Southwest Region: Network Operations, Improvements and Brawley Earthquake Swarm Response” will be presented by UNAVCO staff Chris Walls, Doerte Mann, Christine Puskas, Jacob Sklar, Travis Pitcher, Andre Basset, Chelsea Jarvis, Shawn Lawrence and Sara Looney.